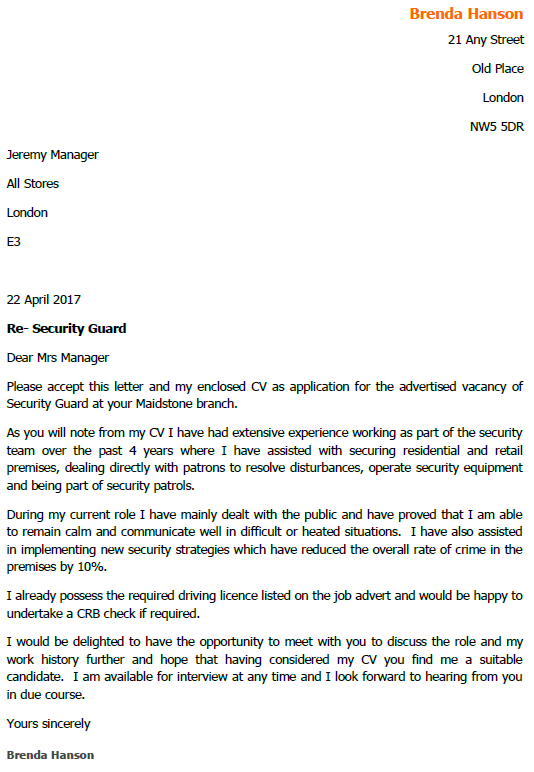 Use this covering letter example to apply for the latest Security Guard job vacancies. You should amend this letter sample as suitable before sending it to the employers. Please accept this letter and my enclosed CV as application for the advertised vacancy of Security Guard at your Maidstone branch. As you will note from my CV I have had extensive experience working as part of the security team over the past 4 years where I have assisted with securing residential and retail premises, dealing directly with patrons to resolve disturbances, operate security equipment and being part of security patrols. During my current role I have mainly dealt with the public and have proved that I am able to remain calm and communicate well in difficult or heated situations. I have also assisted in implementing new security strategies which have reduced the overall rate of crime in the premises by 10%. I already possess the required driving licence listed on the job advert and would be happy to undertake a CRB check if required. I would be delighted to have the opportunity to meet with you to discuss the role and my work history further and hope that having considered my CV you find me a suitable candidate. I am available for interview at any time and I look forward to hearing from you in due course.